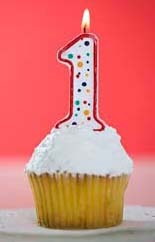 Happy Birthday Rescue Barn! Even though we're still doing final touches (why do things always take twice as long as we expect them to? ), we've had a gratifying first year of fine-tuning our system so the dogs that come here can get the best kind of help. Below: Jiggs enjoys a game of chase as the sun sets. The goal of the project has been to create a space that supports the care and recovery of dogs in crisis. They could be dogs with dog-intolerance or other behavior issues, dogs from cruelty cases, dogs with medical needs - and just plain out-of-luck dogs. It's sort of like an amped up foster home - or, watered down animal shelter. And of course it had to be created on a tight budget with the backbone support of volunteer dog handlers. 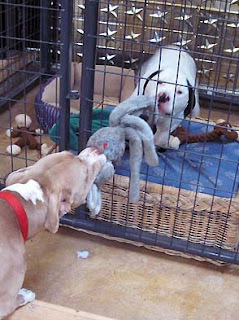 After several years of sheltering experience, we had a good idea of what we did and didn't want to see in our kennels: fence fighting had to be nearly non-existent - so did stressful barking, strong odors, bad break outs of kennel cough and sad, under-exercised dogs. And it all had to be accomplished in a small space that's easy enough to duplicate if someone wanted to do the same for dogs in their community. The entire process has taught us a lot about what's possible. It's a modest project, but it's been working and its lessons are about to be shared with four different shelters who are sending staff to CA for a multi-day "camp" as part of our work with Best Friends Animal Society and PetSmart Charities. We're thrilled to have the chance to host these fellow animal lovers next month and are busy as bees getting ready for their visit. 1. Natural light. Like people, dogs do best when they have some daily exposure to the natural world, including sunlight. It promotes good health and a regular sleep cycle, which is so necessary for getting beyond a stressful past. So many shelters keep dogs in dark spaces lit with artificial light, and minimal windows or contact with the natural world. Just imagine how crazy making that would be for you. The barn was set up with large (salvaged!) 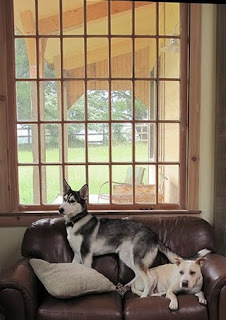 windows so all kenneled dogs can watch the sunrise, and skylights overhead track the sun as it moves across the sky. Every kennel gets a warm patch of sunlight to lay in at least once a day. 2. Supported exposure to other dogs. When appropriate dog-dog behavior is encouraged and supported in a calm environment, kenneled dogs can be a comfort to each other and will form relationships that sustain them during their sheltering experience. We don't particularly like seeing dogs separated from other dogs in walled off rooms, as is common in newer shelters. Dogs are curious creatures and they enjoy peeking in on the sights, sounds and smells of their neighbors. This kind of exposure promotes quicker friendships so under-socialized dogs can practice new social skills with other dogs, starting with simple greets as they become acquainted and move by each other's spaces during out time. While congregating dogs together does increase potential for the spread of disease, we're giving the restful environment credit for an impressive lack of kennel cough so far, as well as the supplements we give incoming dogs. 3. Relaxed exposure to people. When dogs are exposed to people who are relaxed, they can relax too. That may seem like common sense, but it can be hard to find in traditional animal shelters. These receptive creatures are so keenly aware of human signals that kenneled dogs especially can be easily stressed and over excited by the rapid movement of busy shelter workers, banging noises and the loud and sometimes inappropriate interactions of the visiting public. Picture someone banging on your front door all day, or making faces at you from your window when you're trying to rest and recover. Not fun. An unplanned benefit of the barn: The exercise area is butted right up against a golf course, so not only do the dogs get to greet happy volunteers and others visitors at their kennels, the people with the shiny sticks that move just outside their fenced "territory" are so focused on their game that they barely notice the dogs - many just smile politely and wave as they move on to their next hole. Surprise! What we thought might be a trouble spot for alert barking in the dogs has turned into a beneficial socializing opportunity for them - and again, a reminder that they feed off of the energy we humans give them. We still have so much to learn, and so much to share as visitors join us. We're grateful for our fabulous volunteer team and the donors who breathed life into this project. But thanks are probably better given by the dogs who are alive and well because you cared enough to help us make it real (some shown below)... One year strong with many to go. 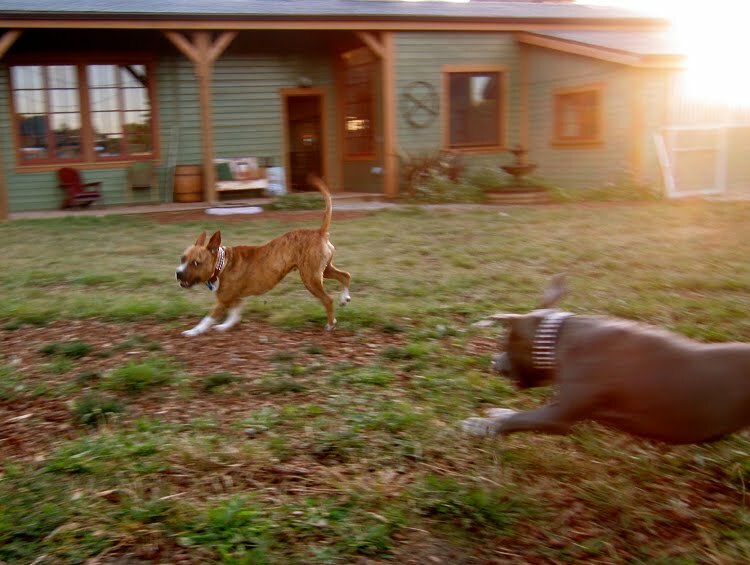 For weekly updates on the barn dogs' progress, visit the Barn Dog Blog. At their best, behavior evaluations (some call temperament tests) - especially those used on canine victims of cruelty - are meant to tease out a few basic behaviors in dogs in order to give responders enough information to plan next steps including a search for appropriate placement options for each individual. 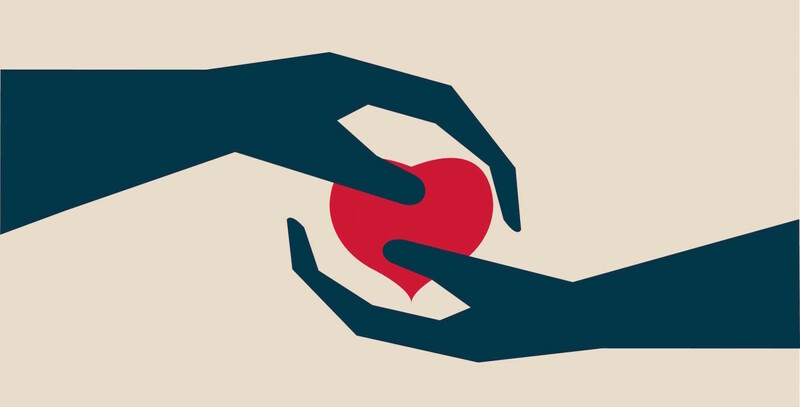 Disposition recommendations are typically broken down into four main categories, including placement into: A) a shelter adoption program B) a foster care home for continued observation and possible adoption placement C) sanctuary for extreme behavior issues or D) euthanasia for a dog that is clearly suffering from medical distress or that is considered unredeemably dangerous. 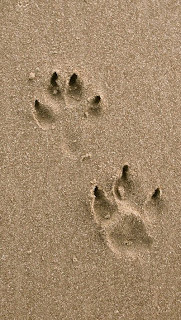 At their worst, behavior evaluations can be used as a formality to hopscotch dogs straight to D.
The worst seems to have happened in Monroe County Michigan recently, where certified animal behaviorist Katherine Houpt VMD PhD condemned a young and seemingly social pit bull named Dusty for reasons that are hard to grasp. In her testimony, the dog presents a public safety threat and "lack(s) any useful purpose." A rescue group's fight to save Dusty has been bolstered by a video tape of the evaluation now making its rounds via Youtube (see below). As longtime evaluators of cruelty victims including dogs just like Dusty, we were rather horrified by Dr. Houpt's recommendations after watching the video. Outside of the fact that the dog presented beautifully in the video, experienced evaluators in animal welfare circles rarely give 'pass or fail' recommendations, preferring instead to focus on each dog's specific issues and needs so appropriate help can be found. 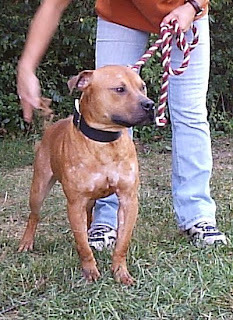 Occasionally dogs get a 'fail' if they're clearly off the charts in their reactions to people - for example, one very troubled dog from the Bad Newz Kennels case was euthanized because she was literally too unstable to be handled. By now you know the story well: out of 49 dogs, 48 dogs from this infamous fighting operation were successfully matched to appropriate rescue and sanctuary situations. An evaluator's main objective should not be to determine which dog(s) should die, but rather, which dogs can be matched to available resources, including qualified organizations that are set up to meet their specific needs. If rescue resources just can't be located after an honest search, it's understandable when euthanasia becomes necessary. But of course then the humans wear the blame for the deaths, not the dogs themselves. A compassionate society doesn't blame the victims of abuse for their fates. When an evaluator jumps too quickly to condemn a dog however without picking up the phone, exploring viable rescue options or even asking for a second opinion, we have a problem. Take a look: I'll leave it to viewers to decide if they feel threatened by Dusty's reactions. Included also is a video of Dusty's reactions to other dogs. For information sake, charted out below is a detailed break-down of disposition recommendations we've used in more than one cruelty case including the Vick dog case and the 'Missouri 500' case. Do you believe Dr. Houpt did an adequate job following animal welfare norms in her recommendations? If not, there's a petition going around that would love your support. Petition to Recant Testimony Let's hope it helps. a. Foster Care/Observation A - These dogs showed no sign of aggression or threat to either people or dogs. Placement is recommended into waiting adoption programs with qualified shelters or rescue groups. b. Foster Care/Observation B - These dogs showed no sign of aggression or threat to either people or dogs. Placement is recommended in an experienced foster care home where additional observation and rehabilitation can take place and may result in these dogs eventually being placed in appropriately screened homes. c. Sanctuary 1 - These dogs exhibit intense fear or lack of socialization with people or other dogs. 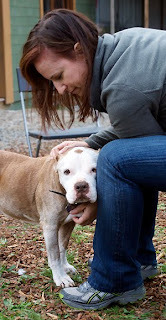 Placement is recommended in a sanctuary situation with more control over the dogs interaction with people and dogs. The sanctuary should provide the dog with controlled experience and interaction with people and other dogs. Some of these dogs may eventually move to a foster care program. d. Sanctuary 2 - These dogs exhibit mild to intense threat to stimulus and may have shown high arousal towards people. Placement in a sanctuary with extensive breed experience is possible. e. Euthanasia - These dogs exhibit aggression to people or intense aggression to other dogs or evidence of a significant medical problem which requires euthanasia. Footnote: The reason dogs like Dusty face such doomed fates in Michigan goes beyond one evaluator's personal bias. Many courts and animal control agencies in Michigan have used an out-dated and vaguely worded Michigan statute to condemn dogs from cruelty cases to automatic death. The wording in that statute was challenged by Kent County Humane Society in 2010 after several canine victims of cruelty in their care were threatened with euthanasia. In that situation, we celebrated when a judge ruled in favor of the shelter's request to make a select number of dogs available for adoption. A win for the dogs. Unfortunately that precedent did not influence this current Monroe County case, and that's very bad news in a state that suffers from perennial BSL threats and breed discrimination. If you live in the SF bay area, bring the kids over to the Martinez Public Library this coming Monday, July 25. 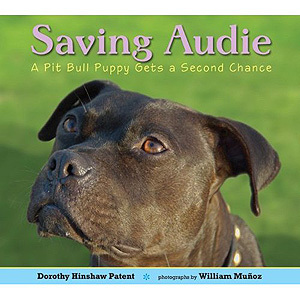 At 6:30pm, Audie will be there to greet his fans along with his trainer and adopter, Linda Chwistek. 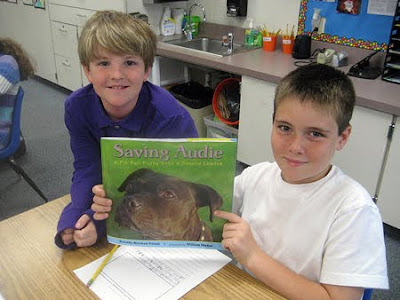 Fourth grade teacher Charity Jara will be reading from the book "Saving Audie" and both ladies will be answering questions. Bring your cameras! Audie is the cutest little stinker you'll ever meet and is handling his new found celebrity like a pro. More on the book Saving Audie. A older gentleman came to us recently wanting to discuss options for his pet should he pass on before she does. His dog is a lovely, four year old pit bull. He had a recent medical scare and at his advanced age, he acknowledged that his time on this planet was limited, so he was busy with tying up loose ends while he still could. He spoke plainly, gesturing with thin arms bruised by needles from a recent hospital stay. His candor was refreshing. We were discussing the life of his dog, and despite the down-to-business tone of the conversation, it warmed us completely to know that our meeting was centered around the life of a special pit bull who was so dear to him. 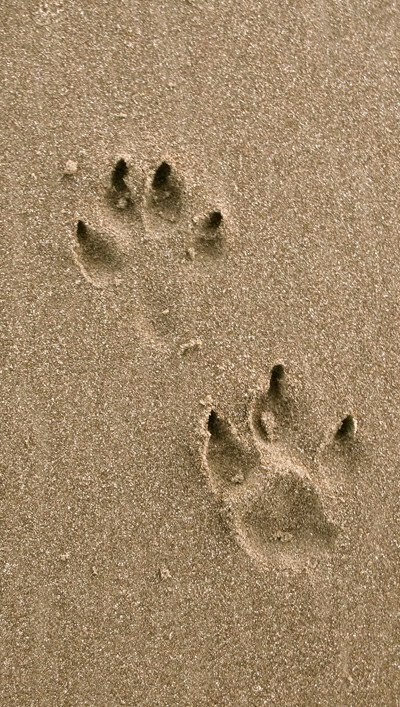 Planning for your pet(s) comfort and care after your death is such a generous demonstration of love. So let's just assume you're going to die someday. It happens to the best of us. What can you do to ensure your dog(s) will live a quality life after you exit? With an estimated 70 million pets in the U.S., you can bet the Internet is loaded with information on estate planning for pets. It's fascinating reading. Some suggestions include writing a letter to your chosen pet guardian that clearly outlines your wishes, and an article on the American Bar Association's website suggests creating a Pet Trust with pet protection agreements to control the disbursement of your funds. Wow. Who knew owning a dog came with these kinds of responsibilities? If you're a pit bull owner, you could face extra work creating secure arrangements for your pet. Landlord biases, HOA regs, insurance obstacles and in some cases BSL might just block your best helpers from taking your dog in. To circumvent this, the lucky home owners among us can arrange to leave their homes to the caregivers who are entrusted to care for the pets. Again, remember that there's nothing stopping them from selling your house and taking your pet to a shelter. But let's assume you have true hearts in your circles. What if you don't have the cushion of a big nest egg or friendly housing to leave behind? 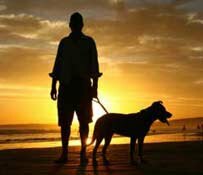 In addition to getting your paperwork in order and your best allies on board, one of the best things you can do NOW is just what our gentleman friend has done with his own pet. Very simply, he's starting to reach out to trusted circles to build her a safety net and - important - he's kept his dog socialized to other dogs. It's just common sense: A well socialized, reasonably trained dog of any breed stands a much better chance of being accepted into a friend or family member's home or rescue organization or shelter adoption program after you pass on. If you read our Barn Dog Blog, you might know that we recently received a dog named Jondi after a friend passed on. Barbara was good enough to keep Jondi healthy and happy, and she left behind toys, treats and up to date vet records. Of course we found a way to fit Jondi in, but not a day goes by that I don't think of how badly it could have turned out if we didn't know her owner. 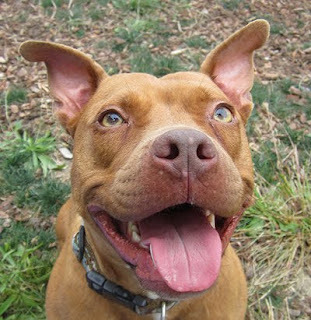 This beautiful girl had really lousy manners with other dogs and would've failed a shelter evaluation in a flat second. She was the queen of fence fighting and reveled in spitting obscenities at other dogs when she was out on leash. Barbara loved her girl, but life got in the way of getting through training classes and Jondi's known behavior issues went unaddressed. An Oakland resident, she would've died fast at Oakland Animal Services. And forget about most rescue groups - Who has a foster home for an under socialized dog who can't live with other pets? Her issues were basically a death sentence. And now the good news: Eight weeks later and after lots of lots coaching, this beautiful creature is now playing with other dogs, getting better leash manners and is well on her way to becoming very adoptable. Jondi's ridiculously lucky, but untold numbers of dogs just like her follow their owners to the grave when workable behavior issues short circuit their survival. This is a such a terrible tragedy for family pets who've known nothing but love, and based on the number of desperate emails we receive from grieving families, it's excruciatingly common. So for the sake of your beloveds, please work to socialize and train your dogs as best you can even while you fight the thought of leaving the planet. Of course you're never going to die. Neither am I. But assuming we just might be mortal, maintaining behaviors that make our dogs "adoptable" is one of the very best gifts we can give them if we're called away to the big dog park in the sky before they are. Jondi with a new friend Jiggs, below. Available for adoption soon! EDIT: Jondi is living large in her new home with two other dogs. Thanks for the help, Jiggs. Here's a training video on using the flirt pole to train/exercise your dog. Dogs learn best when lessons are fun, and this is a great way to turn basic obedience practice into big excitement. We've used these in shelter situations, especially with dogs that can't play with other dogs and it's been a favorite tool for tiring them out while reinforcing new commands. To keep this valuable as a learning tool, the game must stop anytime a dog grabs the toy without permission. Great for healthy dogs, but be aware that the fast turns and jumping could aggravate faulty joints, so use wisely. Enjoy!